As you may be aware, I track US anime releases on amazon, ostensibly to get a rough idea of how much particular lower-end titles might be selling. However, the titles I track each month come from amazon’s anime tag, which is not always applied to all anime-related releases. 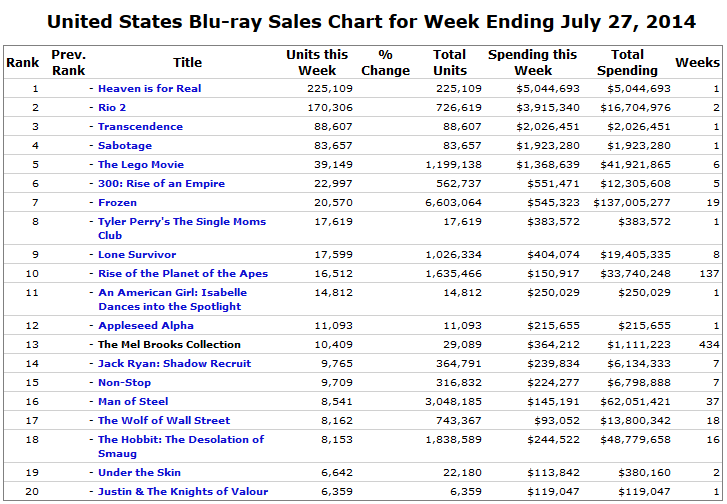 That’s what happened with the US release of prequel movie Appleseed Alpha on July 22 of this year. This is an issue because the BDs of this movie sold over 11k units in their first week on sale, via TheNumbers. It’s a lost opportunity because I could have used it to test predictions, but the datapoint itself is still somewhat interesting in its own right. AA’s total is only 655 fewer copies than that of Attack on Titan’s first set, and that’s without accounting for the fact that the movie’s release was split between BD and DVD versions (as opposed to AoT, where the release was a BD/DVD combo pack counted as BD sales). Attack on Titan may well have the longer sales tail, though; it’s currently ranked at 1,022 while Appleseed Alpha fell back to 6,819 in Movies and TV. It’s worth noting the potential contrast between the two fanbases, one older (and presumably salaried) versus another younger and more casual. This entry was posted in Articles, Fun With Numbers and tagged Anime, Appleseed, Fun With Numbers by torisunanohokori. Bookmark the permalink. Really bad luck to miss one here.